The French SOLEIL ROYAL was named in honour of the Sun KING, Louis XIV. The SOLEIL ROYAL was one of the most powerful warships of her time. She was launched 1669 in Brest and carried 104 cannons. Being the flagship of the French Navy, she was extensively decorated with wooden carvings. The figurehead presented a seahorse flanked by winged maidens. In July 1690, at the battle of Beachy Head, admiral Tourville led the French fleet of 70 ships to a victory against the united English and Dutch fleet of 57 ships. Two years later the situation was less favorable. On 20 May 1692, at the battles of Barfleur and La Hogue, a French fleet with only 44 ships met the English and Dutch with twice as many ships off Pointe de Barfleur. Some the French ships could escape but the SOLEIL ROYAL was so strongly damaged that she ran aground when trying to escape to Cherbourg. On 23 May 1692 she was destroyed by English fireships. 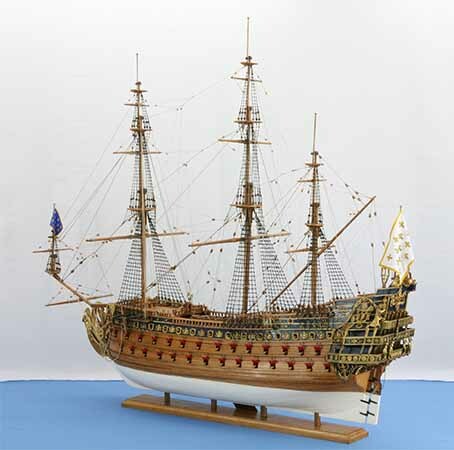 The finely worked, detailed model of the SOLEIL ROYAL clearly shows the impressive lines of hull and rigging that were typical of ships of that age. The model is 1 : 77 scale. Length is 102 cm, width 44 cm, height 94 cm. The ship's hull was painted in royal blue and gold. The decorations are shown in the model in very detail. 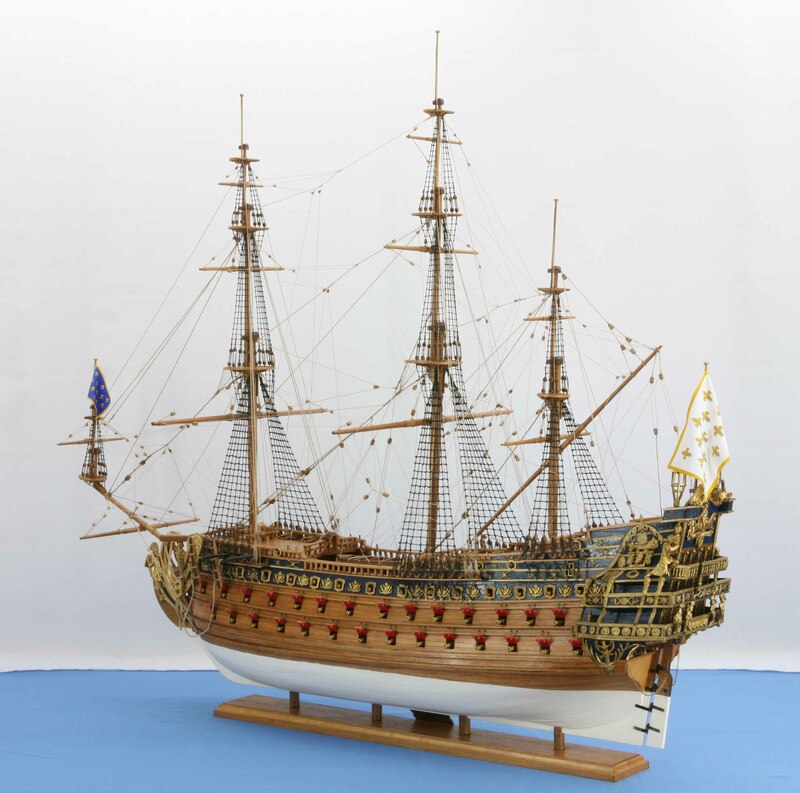 There are more pictures, several views of the entire model and close views of hull, rigging and decorations. Click images to enlarge!